Can't find your message? Some mail not answered by the Baby Name Genie is submitted to our community of baby namers for answering. 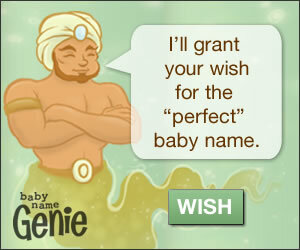 Hi Genie, I'm really struggling with a first name for a baby boy whose last name will be out of the ordinary (Lurks) and I'm really hoping for something that rolls off the tongue as well as is distinguished. Feel free to throw in a middle name if need be... Thanks. An idea for your son slinks into my mind, sneaking up on me, prowling for opportunity. The boy Lurks, lies in wait for a name. To bring him out of the shadows, name him Benedict Adrian. When you think of people with hippie names, you think of high achievers and political juggernauts. When President Cosmic Haden's face appears on a coin, his ingrained anti-capitalism will come to an ironic zenith. Help! I love the name Elsa, and love that it is a Scandinavian name, I am very proud of my Norwegian heritage! Should I be concerned about the Frozen craze? I would love to just 'let it go' and name my daughter Elsa, but I am getting cold feet! Hey, I'm the one that does the puns around here. Actually... those were pretty good. You know, I had the same kind of question from a man in the late 1970's who wanted to name his son Luke. I told him, "It'll blow over. In twenty years no one will even remember Star Wars." That guy still won't return my calls. Elsa is a wonderful name and if that’s what you love, then go with it. Just be prepared for her friends asking her if she wants to build a snowman, and doting suitors insisting that love is an open door. I'm sorry your huhsband doesn't like Dahkota. Perhaps he dehmands a better name. Suhggest Dehvin James and see if he ahpproves. Well! Me and my husband have argued and argued over baby names! I'm done with all the negative attention and need your help. We're unsure of the gender, so both girl and boy name would be appreciated. We want something uncommon but nothing weird. Our last name is Daniels. Thank you! Who doesn't not want negative attention? Certainly not me. I won't not give you Skyler Bailey and certainly not Ella Felicia. Don't do with it as you won't. Hi, a year and a half ago I sent you some mail about a girls name and you suggested Madelyn Sophie, which is now the name of my daughter! But baby number 2 is on the way, and it's another girl! I love the names Clementine and Hyacinth, but do you think they are too "different" from Madelyn? Excellent! Ah, the wisdom of asking mythological creatures for advice. Such good news. Congratulations on your second daughter. Clementine is a better match for Madelyn. Ok genie, I have a challenge for you. I want to see if you really can make a perfect name. Here are the requirements: no common names, first initial can't match any other initial, last name Cooper, must flow perfectly, one boy name one girl name. GO! I want a patriotic name for our child. My wife, Rose, wants a more classic name (she's English). We want the middle initial to be F. Got any unique names (boy or girl) that are still classics? O say, can you see a boy named Scott Francis in your future? A name suitable for the home of the brave. For a daughter, the queen of your castle will be most pleased with Eleanor Florence. I Am Naming My Son Jake And We Want The Middle Name To Be After His Grandpa Trent. What Do You Suggest? I suggest you stop capitalizing the first letter of every word. To your question, Jake Trent is a bit too explosive and abrupt. Try Jacob Trent to smooth it out. My husband and I are looking for a first name to go with the middle name "Adam" preferable that goes well with the meaning of Adam which is "earth". We have a background in ministry and would like it to have some Biblical meaning. Last name is Mueller. While Dusty may be a good name for you, it is, alas, not Biblical. Instead I give you Josiah to pair with Adam, which means the Fire of the Lord.